UNITED NATIONS, April 9 -- As the Sri Lankan Army broadcasts a "final ultimatum" and reportedly fires shells into the supposed No Fire Zone, UN Security General Ban Ki-moon spoke by phone with President Mahinda Rajapaksa. After Ban's spokesperson's bland read-out of the call -- they spoke of "their shared concerns about the civilians still trapped in the area" -- Inner City Press asked if Ban had asked about the ultimatum. "Not on that specific issue that you mention," spokesperson Montas said. They discussed civilians, but not the government's threat that puts them as risk? Inner City Press asked if President Rajapaksa had made any commitment not to send his troops into the No Fire Zone, as some say is slated to happen over this weekend. Video here, from Minute 16:37. "I am not at liberty to tell you details of what was said," replied Ms. Montas. But are any commitments being obtained on these calls? Or as some say are they only window-dressing? Click here for audio of one phone call out from the No Fire Zone, with voiceover on violations of international humanitarian law by Tamil Tigers as well. 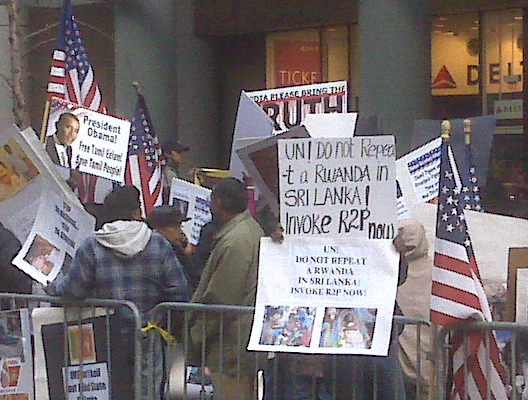 Protest in front of US Mission to UN on April 9, (c) M.Lee: Rwanda sign, Obama poster: Samantha Power, where are you? Thursday in New York there were fasters and protesters in front of the U.S. Mission to the UN on 45th Street, asking to meet with U.S. Ambassador Susan Rice. They never saw her; an organizer told Inner City Press they would be reduced to faxing their petition to Rice. They delivered a petition to Mexico's Ambassador Claude Heller, this month's Council president, but not to Ban Ki-moon. Have they given up on him? The level is despair in the crowd was palpable. One protest organizer asked, "Obama, where is the change you promised?" Others held signs with the words "genocide," "Not another Rwanda" and "Responsibility to Protect." There were all topics of meetings inside the UN this week -- unlike the carnage in Sri Lanka.